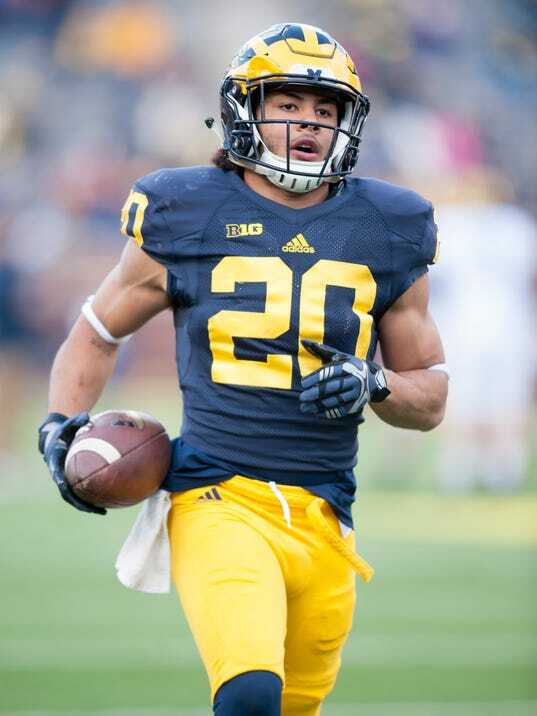 Ann Arbor – Michigan running back Drake Johnson’s football career has ended. Johnson, who grew up in Ann Arbor and attended Pioneer, endured two torn anterior cruciate knee ligament tears during his career and was involved last spring in a freak incident at the track building when he was stretching and was run over by a fork lift. The popular and engaging Johnson, who also has run track at Michigan, ran for 641 yards and eight touchdowns during his career. Offensive tackle Grant Newsome, who suffered a gruesome knee injury last season in the Wisconsin game and spent 38 days in the hospital, is probably a year away from returning to football. Newsome has more recently dealt with an issue on his foot caused, Harbaugh said, by being in bed as long as he was. It had not been healing but is now “much better,” Harbaugh said.